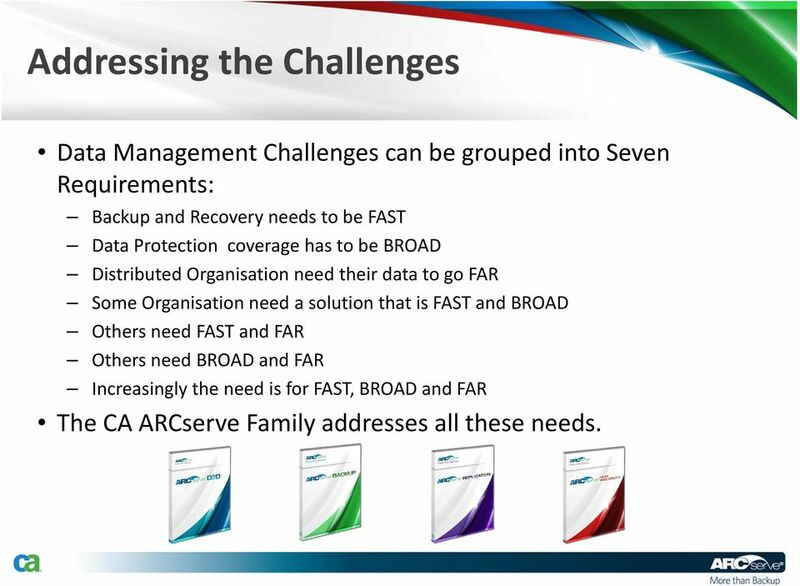 Download "CA ARCserve Family r15"
3 Addressing the Challenges Data Management Challenges can be grouped into Seven Requirements: Backup and Recovery needs to be FAST Data Protection coverage has to be BROAD Distributed Organisation need their data to go FAR Some Organisation need a solution that is FAST and BROAD Others need FAST and FAR Others need BROAD and FAR Increasingly the need is for FAST, BROAD and FAR The CA ARCserve Family addresses all these needs. 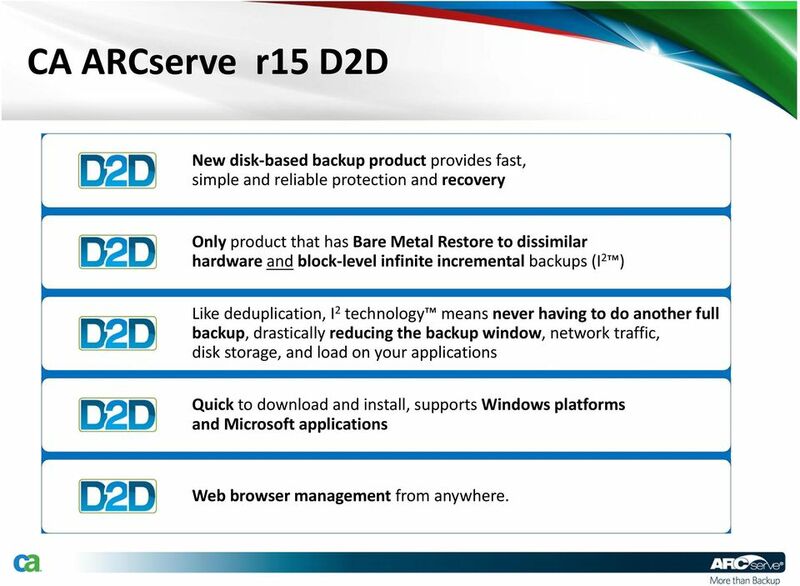 5 CA ARCserve r15 D2D New disk based backup product provides fast, simple and reliable protection and recovery Only product that has Bare Metal Restore to dissimilar hardware and block level infinite incremental backups (I 2 ) Like deduplication, I 2 technology means never having to do another full backup, drastically reducing the backup window, network traffic, disk storage, and load on your applications Quick to download and install, supports Windows platforms and Microsoft applications Web browser management from anywhere. 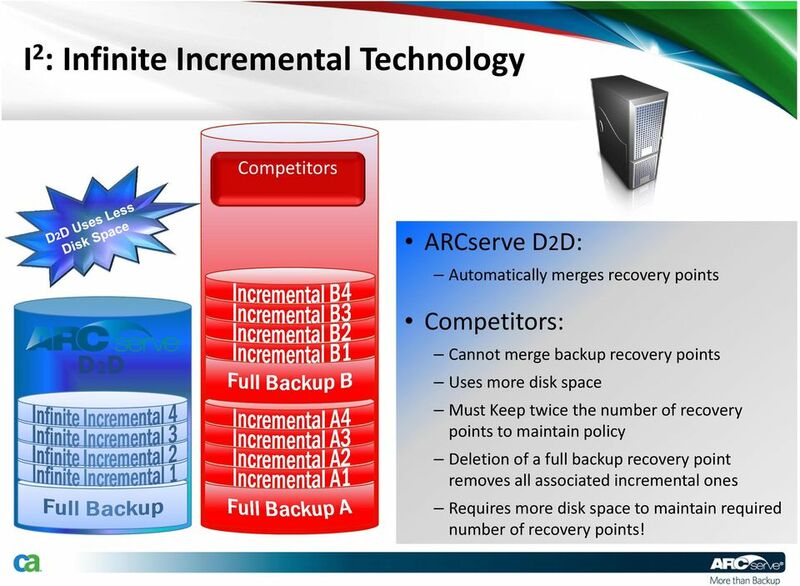 10 I 2 : Infinite Incremental Technology Competitors ARCserve D2D: Automatically merges recovery points D2D Competitors: Cannot merge backup recovery points Uses more disk space Must Keep twice the number of recovery points to maintain policy Deletion of a full backup recovery point removes all associated incremental ones Requires more disk space to maintain required number of recovery points! 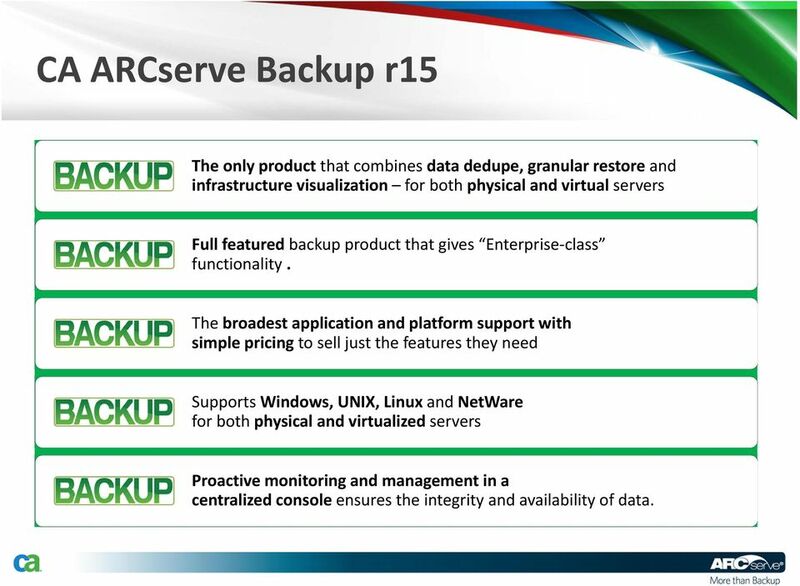 17 CA ARCserve Backup r15 The only product that combines data dedupe, granular restore and infrastructure visualization for both physical and virtual servers Full featured backup product that gives Enterprise class functionality. 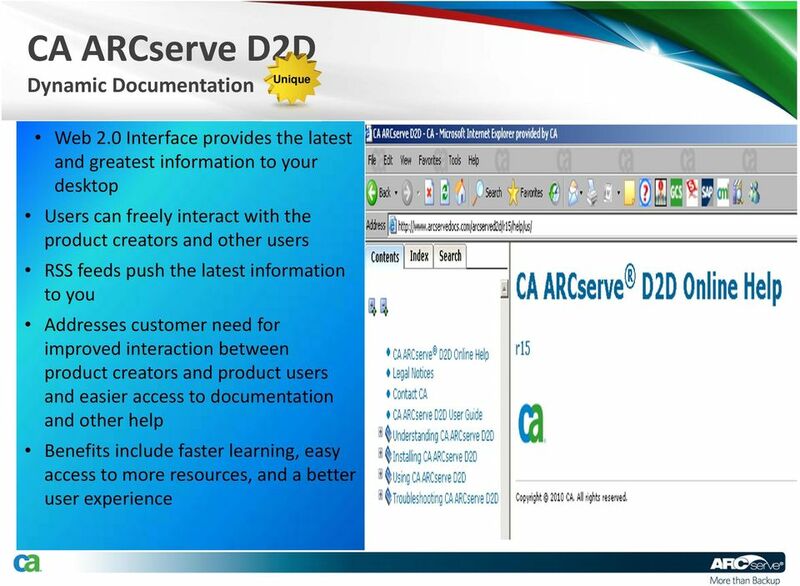 The broadest application and platform support with simple pricing to sell just the features they need Supports Windows, UNIX, Linux and NetWare for both physical and virtualized servers Proactive monitoring and management in a centralized console ensures the integrity and availability of data. 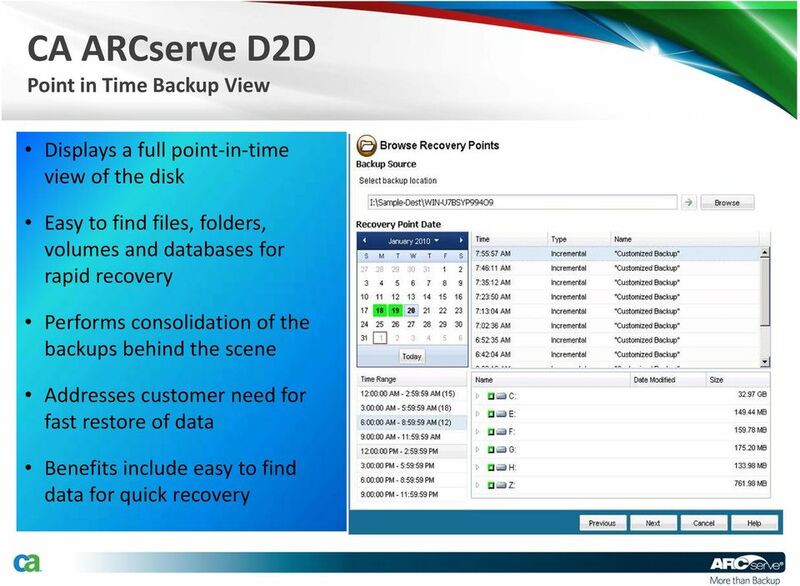 26 Global Dashboard Reports for each Remote Office View all from one central location Global View of server resources, backup status, recovery points from one central place Addresses customer need understand and better manage their entire environment including ROBO Benefits include reduced management time, improved management of ROBO, less work by IT. 45 Increasingly it has to be... FAST, BROAD and FAR! 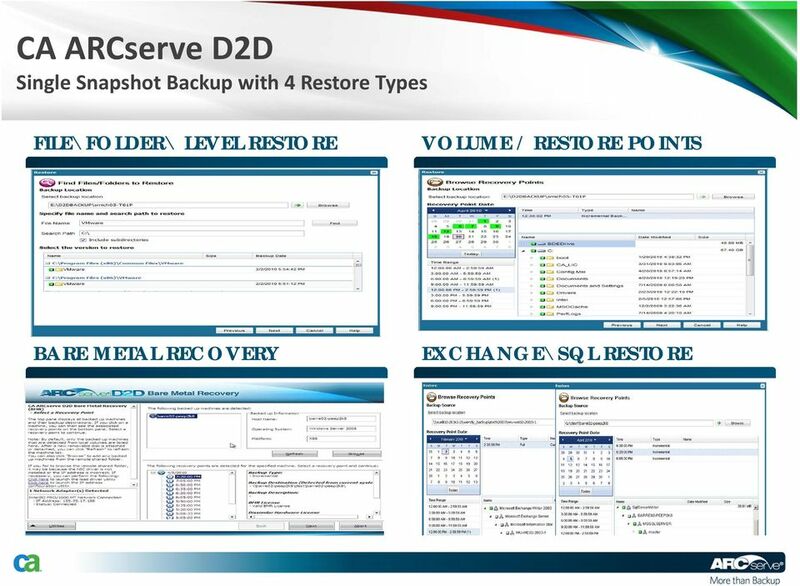 ARCserve D2D speeds up local recovery As ARCserve Backup makes centralized protection manageable! 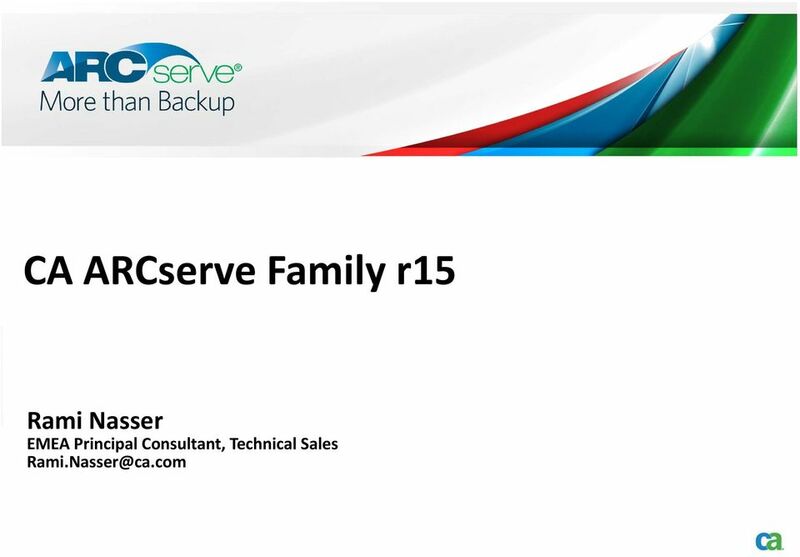 While ARCserve High Availability continuously works remotely! 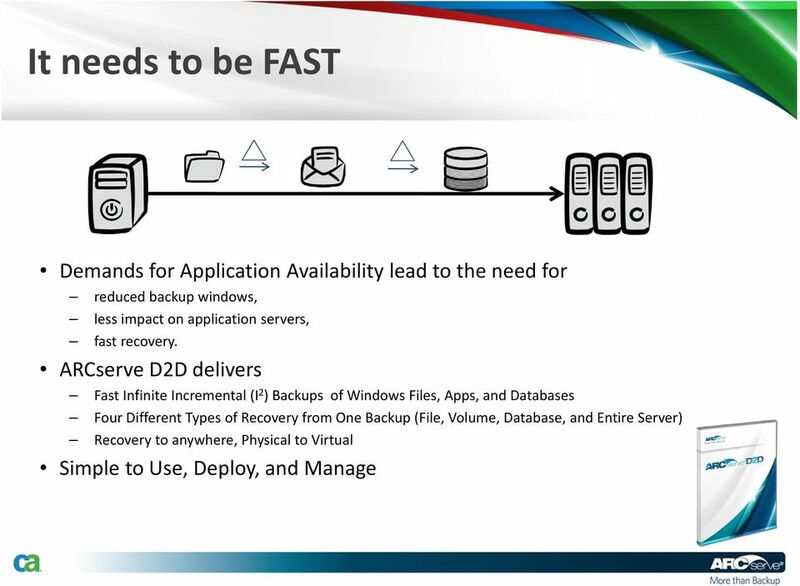 More organisations demand high availability for their distributed mission critical applications. 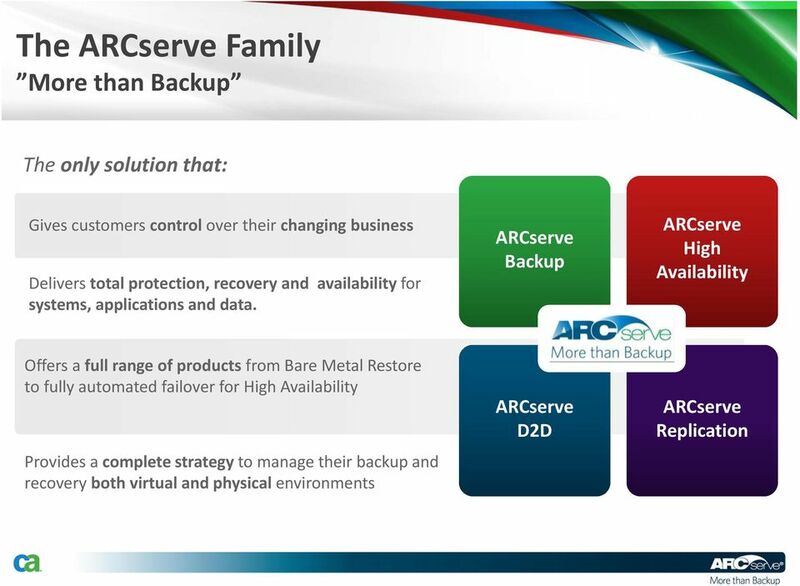 The ARCserve Family of products deliver the complete solution. 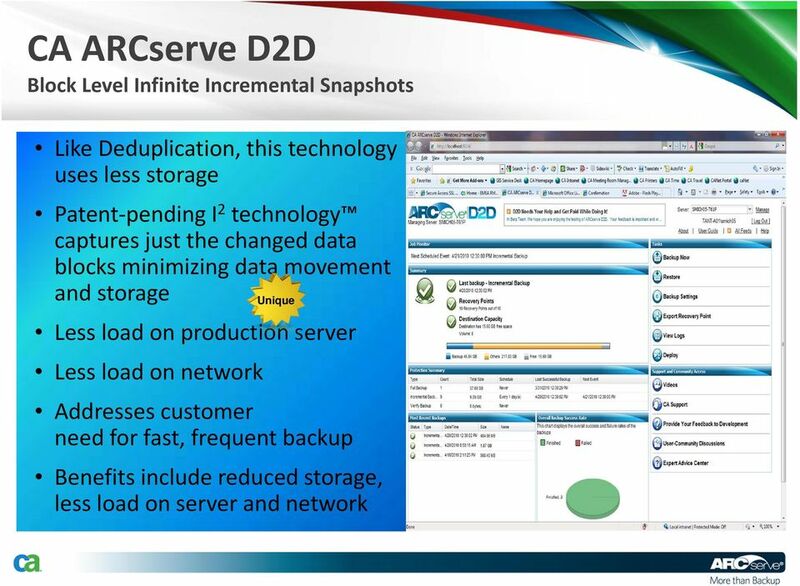 Helping MSPs protect Data Center resources Due to shrinking IT staffing and budgets, many IT organizations are turning to Service Providers for hosting of business-critical systems and applications (i.e. 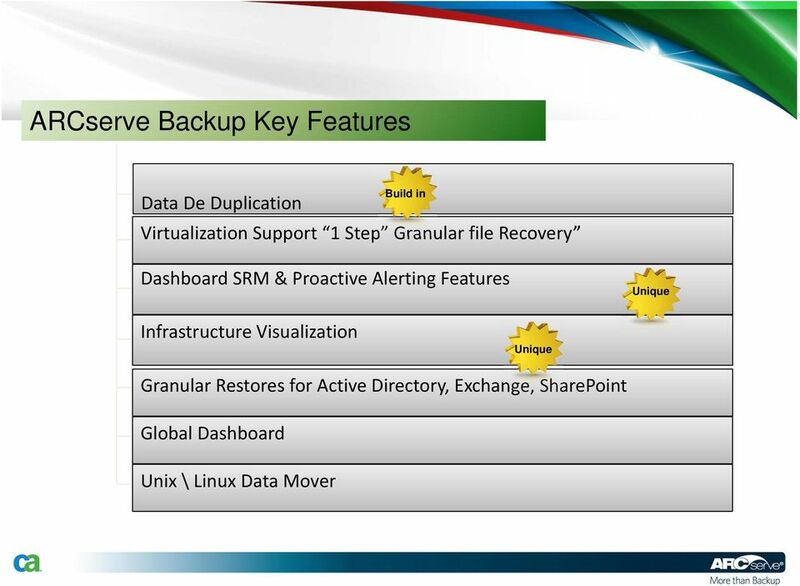 Solution Overview. Jesper Schneider Nordic Distribution Manager. 14 th May 2014. Copyright 2014 CA. All rights reserved. Minimize the impact of downtime and disruption. 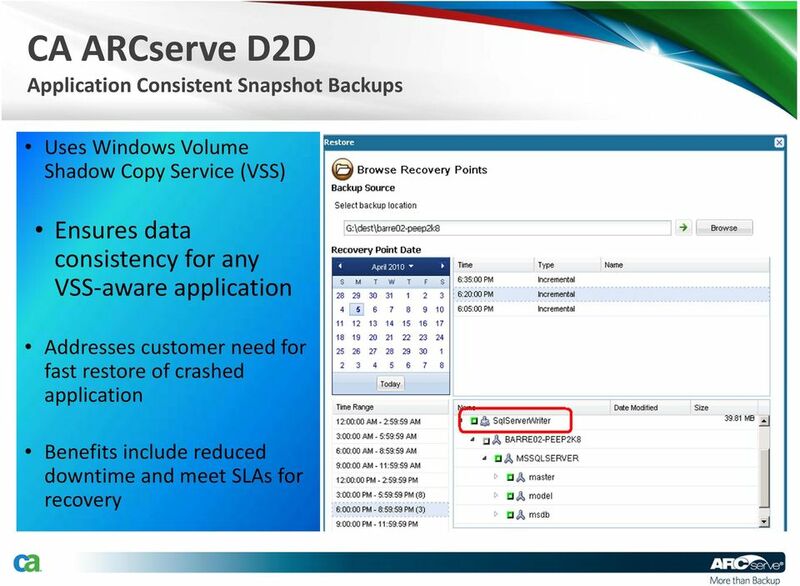 Replace time-consuming manual processes with fast, automated recovery. 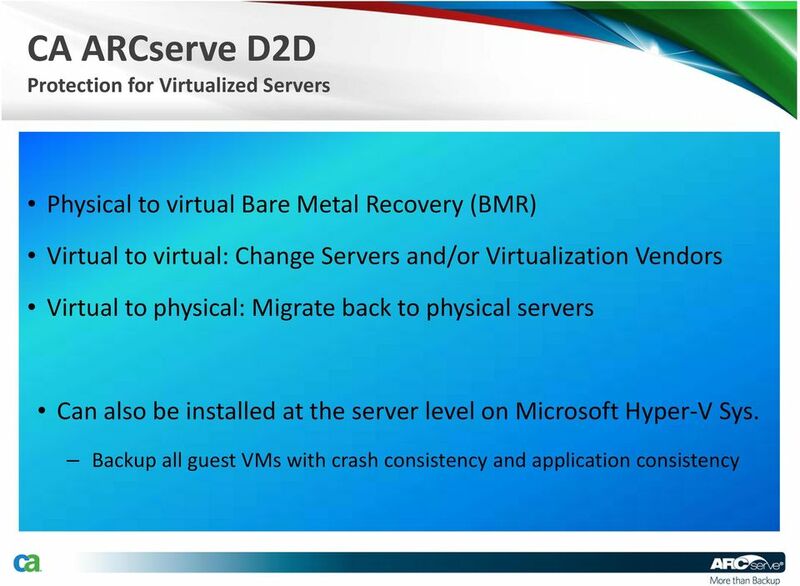 Redefining Backup for VMware Environment. 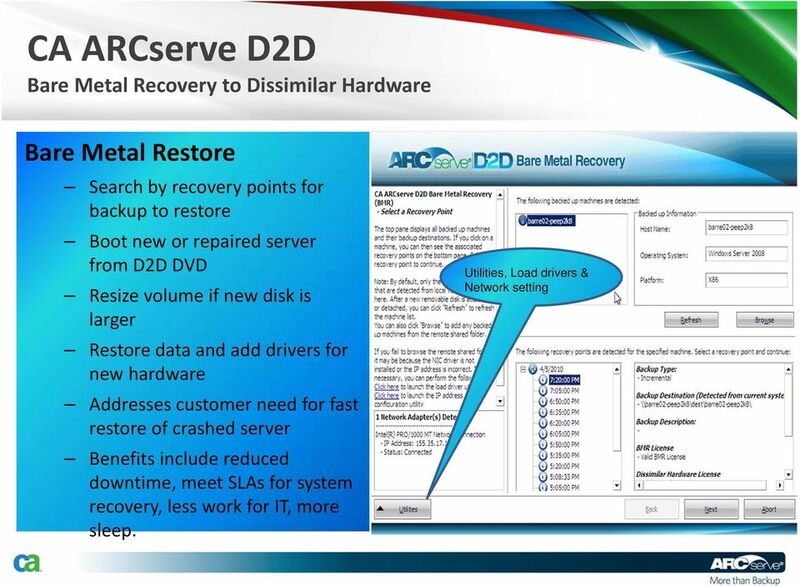 Copyright 2009 EMC Corporation. All rights reserved. 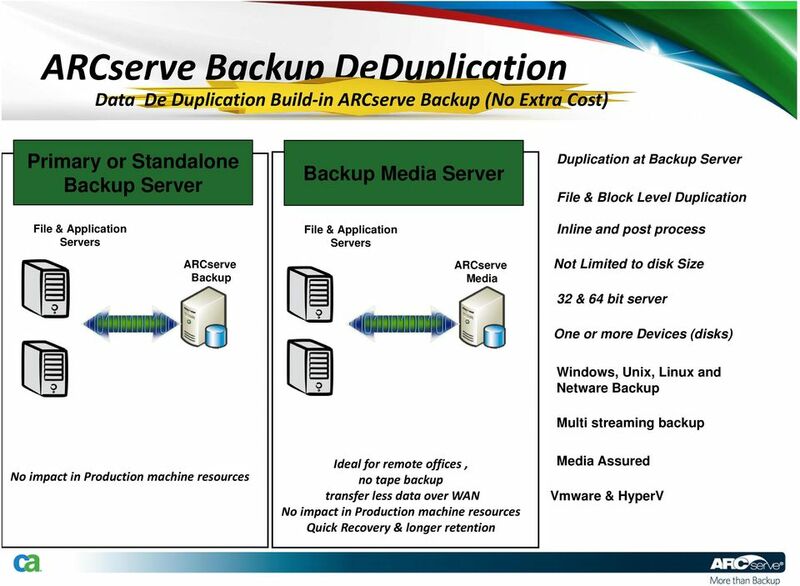 Efficient Backup with Data Deduplication Which Strategy is Right for You? 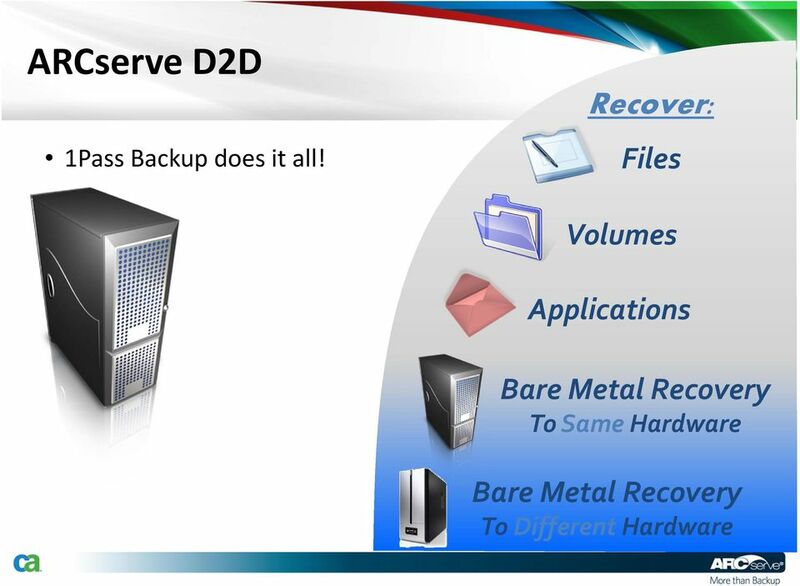 Efficient Backup with Data Deduplication Which Strategy is Right for You? 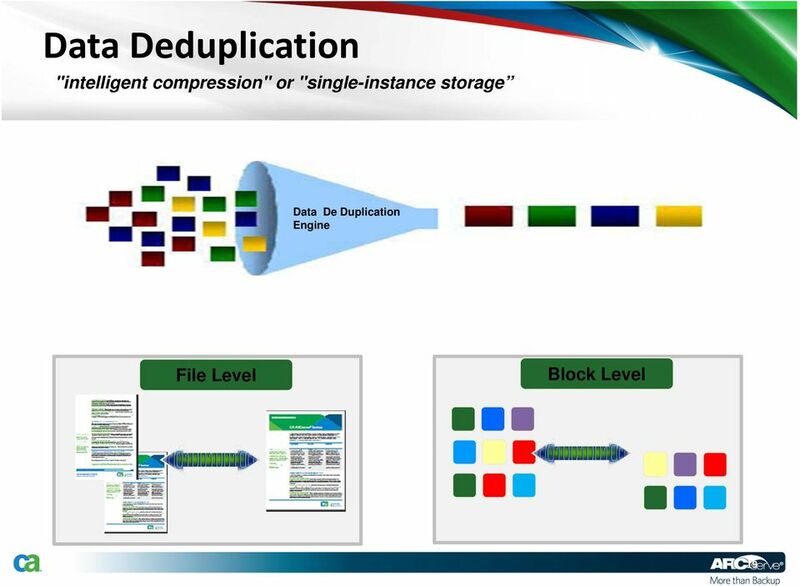 Rob Emsley Senior Director, Product Marketing CPU Utilization CPU Utilization Exabytes Why So Much Interest in Data Deduplication? 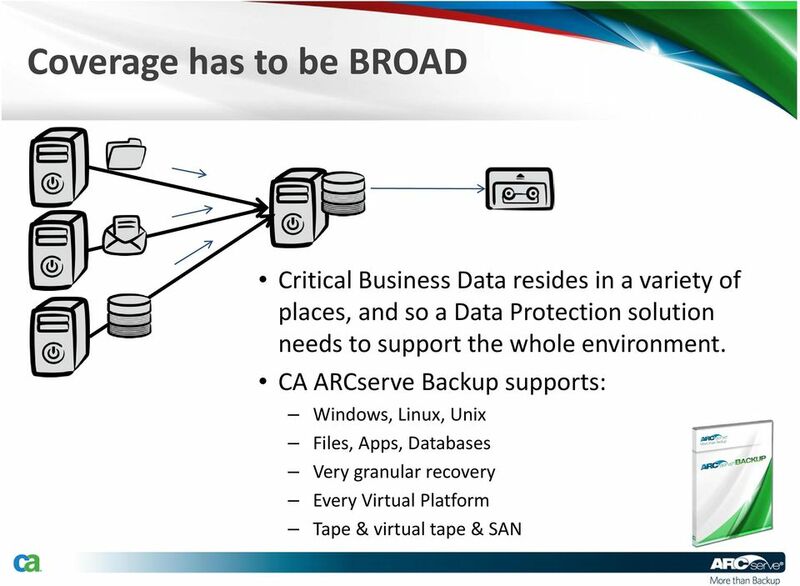 Lakin 1 Ronald Lakin CIS 130 Hardware Nick Romano September 28 2015 Comparing Online Enterprise Backup Systems A reliable online backup system is essential for any business running workstations and servers.